Tom and I were at the supermarket Saturday night because we were running low on milk for our Sunday morning coffee. We had made an early dinner of seafood sausages, rx burgers and beer, but no dessert. Our sweet tooth got the better of us when we were picking up the milk, and we started foraging for some snacks. Every package of cookies I picked up was laden with refined flours, HFCS (high fructose corn syrup) and too many ingredients I couldn’t pronounce. So, instead of buying a box of chemical cookies, I pulled out my iPhone and sought out a recipe I knew I had bookmarked somewhere – Heidi’s Triple Chocolate Espresso Cookies. So much better than anything store-bought, they’re delicious and wholesome, though decidedly not dietetic. I made the whole batch, but froze 2/3 of the dough because neither of us can stop ourselves around fresh baked cookies. Most of all, I was delighted to discover that the base dough was easy and versatile. I’m already thinking about interesting mix-ins like dried cherries, pinenuts and and pretty much every other nut under the sun. In a medium bowl whisk together the whole wheat pastry flour, baking soda, baking powder, salt, and cacao powder. Set aside. In a big bowl or with an electric mixer beat the butter until it is fluffy and lightens a bit in color. Now beat in the sugar â€“ it should have a thick frosting-like consistency. Mix in the eggs one at a time, making sure the first egg gets incorporated before adding the next. You will need to scrape down the sides of the bowl once or twice as well. Add the vanilla and mix until it is incorporated. Add the dry ingredients to the wet mix in about four waves. Stir a bit between each addition until the flour is just incorporated. You could add all the flour at once, but it tends to explode up and out of the mixing bowl and all over me every time I do that. At this point you should have a moist, brown dough that is uniform in color. Stir in the espresso beans and chocolate chips by hand and mix only until they are evenly distributed throughout the dough. Drop the cookies onto baking sheets: I like to make these cookies medium in size (they are rich!) – and use roughly one heaping tablespoons of dough for each one. I leave the dough balls rough and raggy looking – I never roll them into perfect balls or anything like that – this way each cookie will have a bit of unique personality. 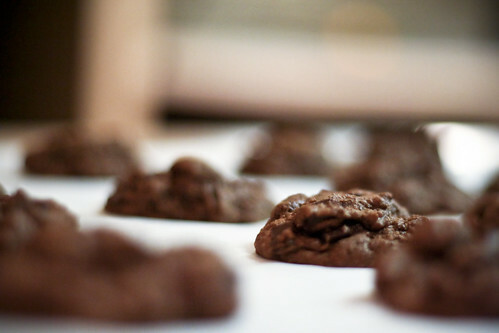 Tip: If you don’t want to bake all the cookies at one once you can freeze some of the dough for quick cookies later. Instead of placing the cookies in the oven put the cookie dough balls into a freezer-quality plastic bag and toss them in the freezer. You can bake straight from the freezer at a later date, up the baking time by a couple minutes to compensate for the frozen dough. Big Batch: 2-3 dozen chunky, medium cookies. I just love so many of Heidi’s recipes! Those look delicious!